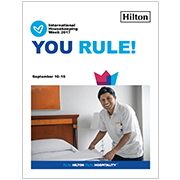 Give Your Housekeepers a High Five! Trace each Housekeeper’s right hand on a piece of paper and hang these on a wall in the Team Member area. Have Team Members guess which hand belongs to which Housekeeper. Whoever has the most correct guesses gets a small prize—and everyone has to give them high fives for the rest of the day!